Habit: small to medium sized shrub with many slender branches. Glossy green leaves are oblong with entire leaf margins. 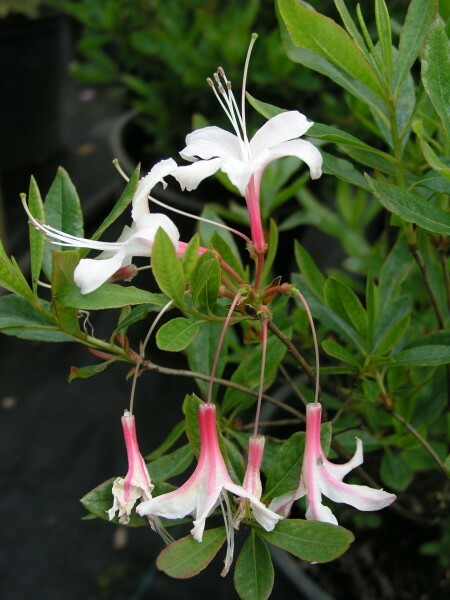 Western azalea is deciduous and in the autumn leaves turn yellow, scarlet or crimson before dropping. White or pale pink, extremely fragrant flowers grow in corymbs (clusters) of 5-20 and have five showy petals with the uppermost splashed with orange on the inside, signaling pollinators. Long stamens protrude out of the trumpet shaped throat. Fruit is a capsule occurring in clusters. Blooms May to June. Ecology: found in moist riparian habitats such as bogs and streambanks as well as in coniferous forests in elevations under 7500 ft (2300 m) from Oregon throughout California. Growing Conditions: full sun to partial shade in well-drained, moist to wet acidic soil. Rhododendron occidentale does not grow with its roots submerged in water and has no tolerance to drought.